Army Brigadier General Bryan T. Roberts. Army Brigadier General Bryan T. Roberts, the Commanding General of the U.S. Army Training Center and Fort Jackson, located in Fort Jackson, S.C., is being investigated for adultery and for being involved in a physical altercation, the Army announced Tuesday. Roberts has been suspended from his duties. The altercation allegedly involved Roberts and an unidentified woman he is now being investigated for having an affair with, a U.S. military official told NBC News. The two were apparently involved in a recent argument. While making up, Roberts allegedly bit the woman’s lip, causing her to seek medical help. 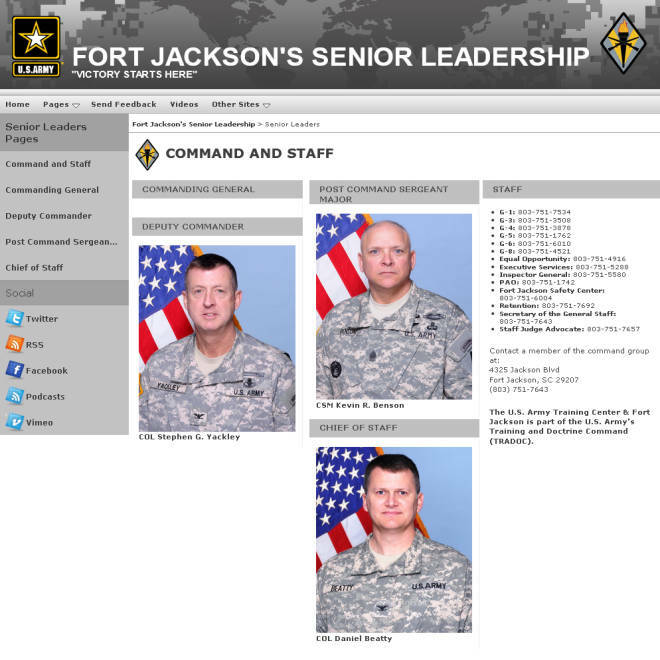 The Command and Staff page on Fort Jackson’s website showed a vacant spot under Commanding General on Tuesday evening. While the investigation is ongoing, Brig. Gen. Peggy Combs, Commandant of the U.S. Army Chemical, Biological, Radiological and Nuclear School at Fort Leonard Wood, Missouri, will serve as the interim commander. A screen shot shows Fort Jackson's senior leadership. The commanding general is notably no longer included on the page.